How to ferment: important factors for quality fermentation. What's so great about fermentation? 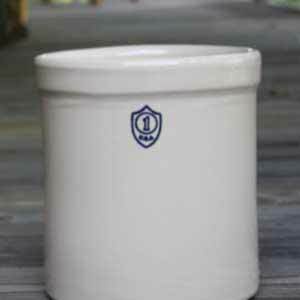 What are the tradeoffs between fermenting crock styles and shapes? Why can't you ferment in an airtight container? How long does it take to make sauerkraut? How does one make sauerkraut? Cracks in my crock: is it still usable? How can I make tap water chlorine-free? There are clear and quantifiable benefits to human health from having fermented foods included in our diets. 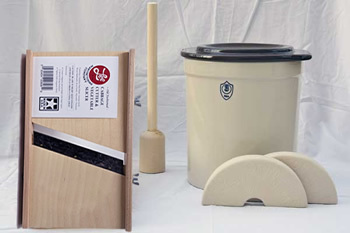 We carry six sizes of Ohio ceramic stoneware fermenting and pickle crocks, weights, wooden lids and preserving covers made in the USA. 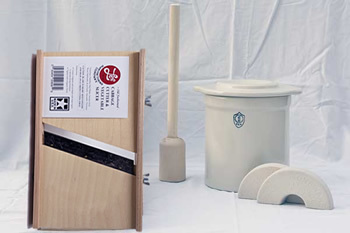 Or select from four sizes of German-made ceramic crocks with water sealing lid and weights. 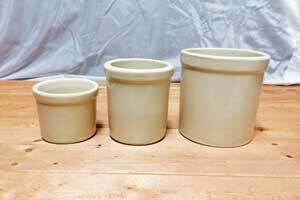 Stoneware ceramic pickling crocks, lids and weights made in the U.S.A. and Germany shipped from Virginia by UPS to arrive within one to five business days of our receiving your order. 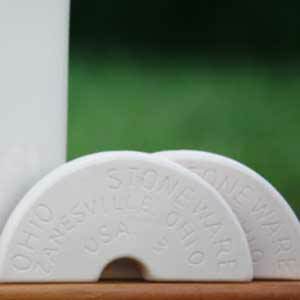 These stoneware ceramic crocks can be delivered to any door in the Contiguous United States. Do you know other fermentation fanatics? Call to organize a reduced-cost wholesale bulk delivery or in-store pick up of crocks. 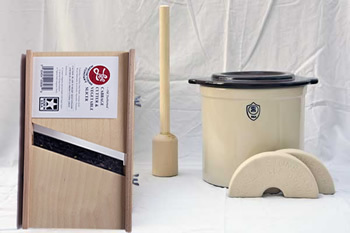 Don't miss our selection of handy sauerkraut making supplies. 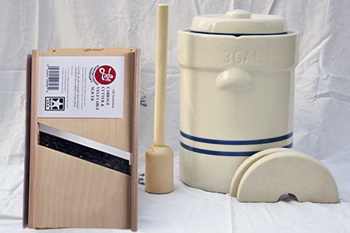 These include cabbage cutters, wooden pounders, pickling salts, stainless steel bowls and hand held cabbage choppers. See our sauerkraut recipe and learn how to make DIY sauerkraut in a ceramic crock. 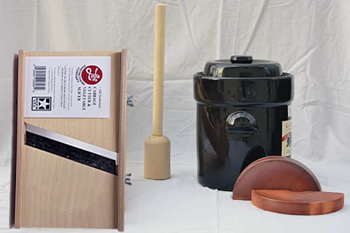 Fermentation is one of the oldest and most important food preservation technologies. Fermentation occurring naturally is generally part of the process of decay. Controlling the fermentation process, however, gives many tasty rewards. Indigenous fermented foods like bread, wine and cheese have been made and consumed for thousands of years and are strongly linked to culture and tradition across the globe. Humans once knew the value of fermented foods, however after the beginning of the industrial revolution with new pasteurization and refrigeration tech the popularity of homemade fermented foods diminished. Fermentation is, "the slow decomposition process of organic substances induced by micro-organisms, or by complex nitrogenous substances (enzymes) of plant or animal origin," according to Azam-Ali and Battcock’s 1998 article A Global Perspective: Fermented Fruits and Vegetables, "Fermentation is a relatively efficient, low energy preservation process, which increases the shelf life and decreases the need for refrigeration or other form of food preservation technology." Traditions from the Blue Ridge Mountain heritage Foxfire Book explain, "Be sure that th'signs are not in th'bowels," says Daisy Justice. "When the moon is new is the best time to make kraut, pickle beans, corn, or green tomatoes. If the signs are in the bowels they will be slimy or soft and not fit to eat (Wigginton, 1972 p.176)." Ingredients: Selecting good quality ingredients is important when fermenting food. It doesn't generally matter if the ingredients aren't picture perfect – cider vinegar won't look or taste any different for using ugly apples – but avoid using old, rotting, or very dirty food. Salt: Salt is used in many fermentation recipes. It draws liquid from foods thereby restricting undesirable bacteria and mold development. Do not use iodized salt which is known to hinder the fermentation process by restraining the growth of desirable bacteria and lactic acid formation. Salt appropriate for fermenting is known as "pickling salt" or "Kosher salt". Water: Avoid using chlorinated water (any water where chlorine has been added by residential municipalities to control bacteria growth), if possible. Chlorinated tap water can restrict the fermentation process similar to iodized salt. Jump below to learn how to make tap water chlorine free. Temperature: Foods undergoing fermentation are sensitive to cooler and hotter temperature preferences. Generally a warmer temperature is called for at the start of fermentation, and once fermenting has peaked cooler temperatures should be reached. Heat affects the rate of fermentation and thus, microbe growth. Allowing fermentation to take palace in appropriate temperatures will successfully produce a desirable flavor. Fermentation increases vitamin levels, good bacteria and enzymes that boost the immune system, promote intestinal wellness and have richer flavor than normal foods. Micro-organisms of fermentation contain certain enzymes, such as cellulases, which are incapable of being synthesized by humans. Microbial cellulases hydrolyze cellulose into sugars which are then readily digestible by humans. Acetylcholine, a product of fermentation, helps to stimulate peristalsis (the movement of food through the intestine), improves blood circulation, prevents constipation, and helps crank up gastric juices when they are insufficient and down-regulates them when there is too much. In short, products of fermentation contain tons of probiotics. Vitamin K2, known to fight cancer, is abundant in fermented foods. In Cancer Preventive Impact of Naturally Occurring, Non-nutritive Constituents in Food (Frohlich et al 1997) , report substances in fermented foods have been found to have a protective effect against the development of cancer. A (Svanberg, 1992) Tanzania study showed that children fed with fermented gruels had a 33% lower incidence of diarrhea than those fed unfermented gruels, owing to the inhibition of pathogenic bacteria by lactic acid forming bacteria. 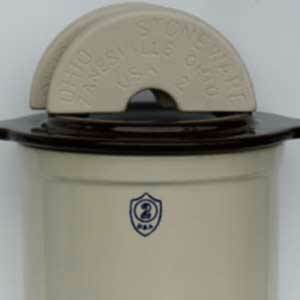 The cylinder is the most popular crock in the United States. The crock producing capital of the United States of America is known to be Roseville, Ohio. Across the world, other cultures developed crock designs. There is not a right or wrong way to harness the power of fermentation. Every vessel for fermentation involves tradeoffs. 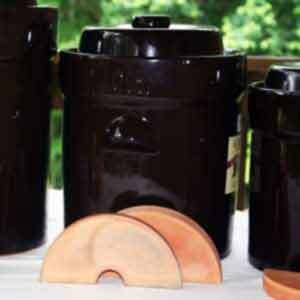 So have no fear, try any shape fermentation crock you want. 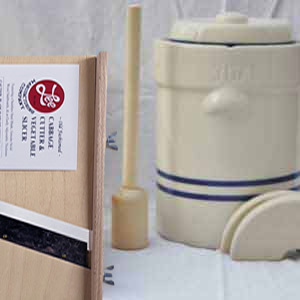 Fermenting in the USA has taken place in a ceramic crock with a simple cylinder shape. The straight cylinder shape provides the largest easy-to-accesses surface area. 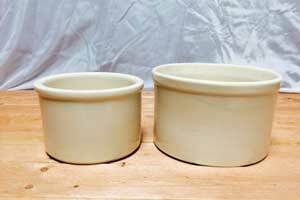 Cylinder crocks make compressing your ferment with weight easier. Fermenting sauerkraut and other vegetables does not require oxygen. The benefit of an open crock is so pressure won’t build up. The contents are also easy to get to so you can smell, see, taste and learn as the ferment matures. The con of an open crock is that access to oxygen enables aerobic (formed-in-oxygen-environments) yeasts and molds to develop on the ferment’s surface. Read more about surface molds and what to do about them below. 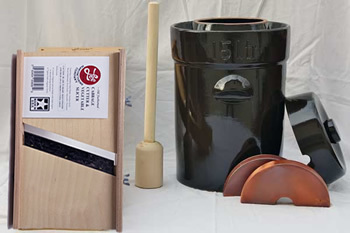 The German crock design has lip around the opening mouth designed to prevent any outside air from getting in and semi circle weights for keeping the vegetables submerged. This is a very efficient method for preventing the surface growth of anaerobic yeasts and molds. The disadvantage to the German design is that it’s only effective if you leave the crock sealed. If you want to look at, feel or smell your food the fundamental purpose of the design is defeated (Katz, 2012). A glass jar with any liquid submerging raw food will ferment. Fermentation professionals say - the wider the lid the better. Use larger jars for the fermentation process and smaller ones to store and share your creations (More about jar storing ferments). There are MANY methods and materials for doing glass jar fermentation. 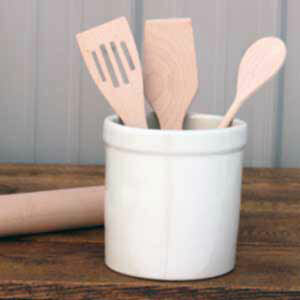 Soon, you'll want to do larger batches and graduate to stoneware ceramic crocks. A loose-fitting Mason jar lid, a small hole drilled in the lid, or a plastic air lock fitted with a rubber jar gasket to make a tight seal (these air-lock Mason jar lids aren’t just DIY from your wine store anymore), are all effective methods to allow excess pressure to escape. Because pressure builds up during the production of lactic acid in the form of carbon dioxide gas (in heterolactic (alcoholic) fermentation - shown in this fermentation chemical reaction info graphic!). Fermenting cheeses create little anxiety, however fermenting vegetables or liquids in a sealed jar can cause pressure to build up and, if it isn’t released often, explode. Peel the cabbage. Remove damaged leaves and core. Slice cabbage as thinly as you can. Mix cabbage and salt well in bowl. Pound cabbage while rotating bowl for maximum coverage. Squash cabbage into the crock with fist or cabbage stamper until liquid rises over the cabbage, this liquid is the signal that weights can be placed inside the crock and on top of the cabbage. There are many styles of lids and weights. Semi circle weights are handy for keeping the vegetables submerged (read more about ceramic weights and lids). Place lid on crock and, if you're trying the german style crock, add water along the ring to seal in the fermentation process. 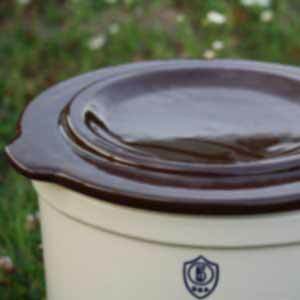 Learn more about pros and cons to various crock styles. For the german style, except for keeping an eye on the water level around the rim, leave the crock and its interior totally alone. If the water gets too low the outside air seal will be broken. If your kraut isn't sealed from outside air exposure, you'll want to check your ferment every day or so and skim off surface mold that develops (Read about surface molds). You’ll need a cool place to store your crock for three to four weeks while the fermentation process of cabbage and salt to sauerkraut ensues. Specifically, that’s temperatures of 60 to 70 degrees Fahrenheit. How to make Appalachia style apple beer. Peel your apples and dry the peelings in the sun or by the stove. Put them in a crock and add enough boiling water to cover them. Cover the crock and let it sit for one or two days, until all the flavor comes out of the peelings. You may add some sugar of you want (Wigginton, 1972 p.173). We carry apple peelers for peeling large bushels of apples! It's a problem - crocks are fragile and heavy. They can crack pretty easily. If you have a crock with a hairline crack, check to see if it still holds water. Fill the crock with water and monitor the level to see if it leaks over the course of a day and night. Molds can grow in these cracks (many times being the reason the crack is discovered). Use vinegar or hydrogen peroxide to scrub the area before washing with hot soapy water and rinsing. What to do about surface mold and yeast growth? Submerging vegetables in water is a technique for fostering fermentation (with no oxygen). 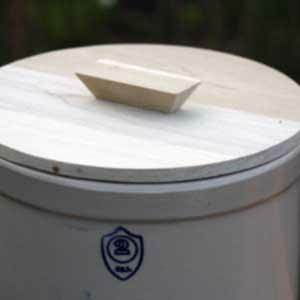 If you're using an open air container, “The edge” or the area where the vegetable / liquid brine meets the oxygen-rich air, encourages the frequent development of yeasts and molds. Surface mold and yeast growth is common and normal. Indeed, it should be removed but is not cause for alarm and doesn’t mean your fermentation is ruined. Remove molds by first removing weights and interior lids. Then, skim the mold from "the edge" with a stainless steel spoon. As long as the mold is white it isn’t harmful. If other color molds start to grow, do not eat them. The longer you allow a mold to grow, the deeper it penetrates your ferment, and there’s not much more unpleasant than moldy-tasting kraut (2012). 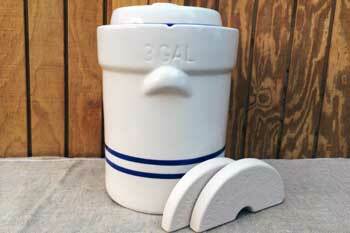 Try the German ceramic crock design. Like with any crock style there are pros and cons. A crock may or may not have a lid or it may have two lids. Interior lids sit atop the food being fermented to keep it underwater. Exterior lids cover and enclose the crock. Some crocks come with lids, some people purchase or fashion flat wooden disks or improvise with plates. Unless you have a very flat dense weight, like the preserving weights from Ohio, you’ll need a flat object with heavy objects on top of it (I’ve seen gallons of water, rocks (but not limestone which can dissolve in the acid), to hold down your ferment. The interior crock lid must have enough space so it won’t get wedged inside the crock or, even, cause the crock to burst open. 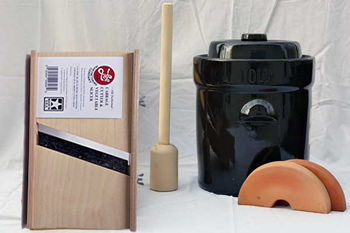 Crocks naturally taper inward and materials like wood expand in the fermentation brine. Don’t be tempted with a tight fitting lid. When fermenting vegetables it is advantageous to breakdown their cell walls and release the juices by pounding them. On a small scale vegetables can be squeezed. Large or frequent batches require a tool. Any sturdy wooden tool can get the job done or try “The Kraut Pounder”. Salt also aids in releasing the water from vegetables. Fermentation products should still be protected from air after the process is complete. Transfer your fermented foods to glass jars with storage lids that can be shared and eaten from. When a jar becomes half empty, it is also half-way full of air. In warm temperature particularly, but also in a refrigerator, vulnerability to molds increase when there is more air in the jar. Transfer the remaining kraut from half-empty jars to fill up smaller jars with no significant air for mold growth to develop. Tap water can be made chlorine-free in most areas simply by boiling it and letting it cool again, or even just by leaving it in an uncovered pot overnight. This doesn't work in areas where the water is chlorinated by adding chloramine to the water, a practice done specifically to keep the chlorine in the water. Many modern water filters will remove both chlorine and chloramine, however. The information provided on this page is for educational purposes and does not intend to promote specific fermentation vessels or methods over others. Battcock, M., & Ali, S. (1998). Fermented fruits and vegetables: a global perspective. Rome: Food and Agriculture Organization of the United Nations. Katz, S. E. (2012). Basic Concepts and Equipment . The art of fermentation: an in-depth exploration of essential concepts and processes from around the world. White River Junction, VT: Chelsea Green Publishing. Wigginton, E. (1972). Preserving Vegetables . The Foxfire book: hog dressing; log cabin building; mountain crafts and foods; planting by the signs; snake lore, hunting tales, faith healing; moonshining; and other affairs of plain living (). Garden City, NY: Anchor Press Doubleday.